Blaze Media Pro includes a powerful VCD burner feature that can burn Video CD (VCD/SVCD) discs from MPEG-1 and MPEG-2 files with ease. To use the VCD burner feature of the software, click the Conversions > Burn Video CD (VCD/SVCD) menu from the software's main window or select Burn Video CD (VCD / SVCD) from the Burn CD / DVD popup menu. From the resulting VCD burner window, you can then choose the MPG video files you wish to burn. Note: if you have AVI or WMV files that you want to burn to VCD, you can easily prepare them for burning using the software's Video Converter feature. Add the file(s) to the video converter feature's list, and select MPEG-1 with VCD extensions (if you want to burn a VCD disc) or MPEG-2 with SVCD extensions (if you want to burn a SVCD disc). 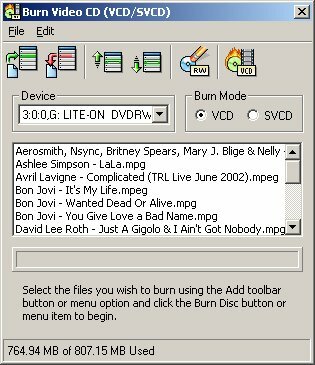 Once the conversion is complete, you can then add the new MPG file(s) to the Burn Video CD (VCD / SVCD) feature's file list. With he files to burn present in your list, select the burner device you want to use, choose between the VCD or SVCD burning modes, and click File > Burn Disc (or the Burn Disc toolbar icon) to burn the VCD/SVCD. The burning feature is very fast and easy to use. Advanced options are available for those who want to take advantage of them, though they are completely optional, making Blaze Media Pro the perfect VCD software burner / converter for users of any experience level. Click here for more information on Blaze Media Pro and its VCD burner features or download your copy now.